No matter what your need is for epoxy flooring we can help. From garages, basements, pool decks to large warehouses and more! Epoxy Flooring Boise is your one-stop shop. 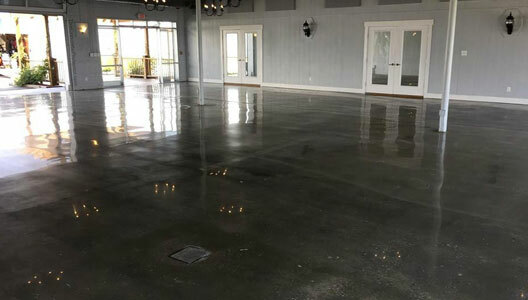 From beautiful wood stamped concrete and overlays to polished concrete and epoxy flooring, we serve homeowners and facility managers with a range of reliable concrete services. We specialize in epoxy floor coatings in Boise to protect and update the appearance of your concrete surfaces. Epoxy flooring protects concrete from moisture, stains, and heavy loads and it can be customized with nearly limitless colors, patterns, and effects like sophisticated metallic epoxy flooring. Our high-grade epoxy coating solutions can be used for all types of environments from garage floor epoxy to commercial settings. Homeowners appreciate epoxy flooring for its high-performance and long-lasting surface. Garage floor epoxy is a popular solution because it resists damage from gas and oil spills, moisture, dropped objects, and hot tires. It also stops concrete dusting while creating a seamless surface that’s easy to clean and maintain. Our epoxy basement floor system helps waterproof the basement with a slip-resistant, attractive surface. We can customize the look of your epoxy coating to match your basement’s design whether you choose a solid high-gloss color, a fleck pattern, a metallic epoxy floor, or something completely you. 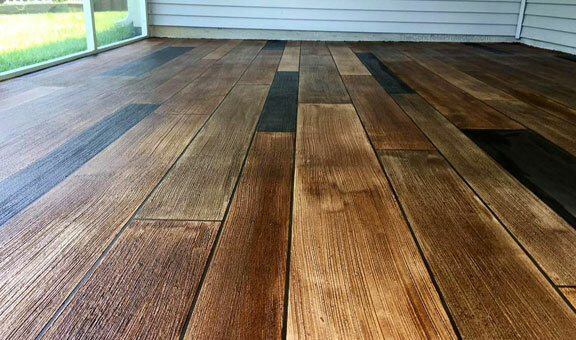 If you love the look of a real wood patio or even interior hardwood floors but hate the thought of the maintenance, our wood stamped concrete is the perfect solution. A concrete wood floor can be used to turn an existing or new concrete slab into a high-performance yet low-maintenance floor system that looks just like a wood plank floor. Wood stamped concrete in Boise, Idaho is as resilient as regular concrete against weather, damage, and wear and tear. Our contractors install concrete that looks like wood in commercial and residential settings to achieve a beautiful aesthetic effect. For a new slab of concrete, we will pour the slab and stamp it with special wood plank stamps before the concrete sets. This will imprint the slab of concrete with the realistic texture and pattern of wood grain. We will combine these stamps with a range of stains to mimic the natural color variations in wood. Want to give an existing concrete slab a facelift? We can create concrete floors that look like wood with a stamped overlay. A new concrete overlay will be poured over your concrete, as long as it’s in good condition. Before it sets, it will be stained and stamped with a wood plank design. The stamped concrete wood look in Boise, Idaho is a popular choice for commercial properties to add pattern and texture to pavements, especially around hospitals, shopping centers, and other large facilities. Our wood stamped concrete floors are also popular among homeowners. Even the best spring cleaning of your garage will still leave you with a dusty and dreary space that you probably aren’t eager to spend time in. An epoxy garage floor coating in Boise, ID is an affordable and easy way to completely transform your garage. Our professional garage floor epoxy creates a hardworking and attractive flooring system that can last decades while resisting everything from oil spills to heavy traffic. Garage floor epoxy creates an industrial-grade floor system that protects the underlying concrete slab from moisture, stains, and other types of damage. It can also help waterproof your garage, stop concrete dusting for good, and give you a surface that withstands anything you throw at it. Garage epoxy is the leading choice among hobbyists, home mechanics, and homeowners because it can take a beating without showing wear. Our garage floor epoxy contractors take the time to prepare your garage floor ahead of epoxy installation. This includes repairing cracks and damage and diamond grinding the floor if necessary to remove imperfections and create a rough profile for superior bonding. 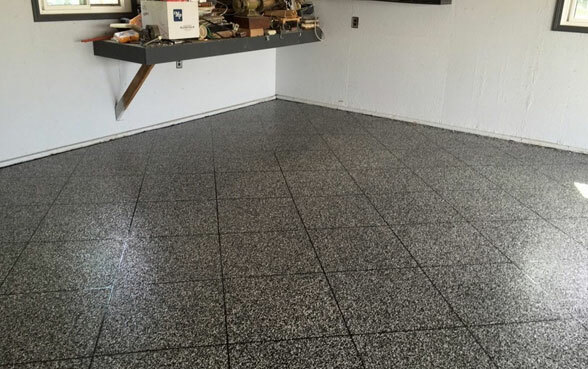 When professionally installed, a garage epoxy coating creates a smooth, seamless surface that will be easy to sweep, mop, and maintain with very little effort. Garage floor epoxy isn’t just strong and protective; our epoxy garage flooring installers in Boise can also customize the look and feel of your epoxy flooring. You may want a sleek matte finish or a bright high-gloss finish that looks like a car showroom. If a solid color isn’t quite what you’re looking for, we can add a personalized pattern or even a logo, such as your favorite sports team. We can even create stunning and sophisticated effects with metallic epoxy garage floor coatings. This can achieve the look of liquid metal, reflective water, lightning strikes, or swirling clouds. Polished concrete floors in Boise, Idaho are an excellent way to improve the appearance and durability of your concrete floor. Our concrete grinding and polishing densify the concrete and seals the pores for a water-resistant, strong, and long-lasting flooring solution. As one of Boise’s leading concrete polishing companies, we offer concrete grinding service for residential and commercial applications. While many think of polished concrete as a solely industrial or commercial solution, it can also be a beautiful and hardworking solution for garages, basements, and other residential settings. A polished concrete floor doesn’t need to look industrial, cold, and sterile. We use a multi-step approach that allows us to customize the color, pattern, and finish of your polished floor. Along with the use of stains and different levels of finishes, we can even incorporate logos, graphics striping, and more into your floor. It’s even possible to achieve the look of stained wood. A polished concrete floor is an economical solution that uses your existing concrete slab. Once the surface of the concrete is sealed and densified, it repels chemicals and other liquids while resisting damage from wear and tear. Wow, you guys really did a fantastic job. From start to finish I had a great experience, all of the staff was very friendly and knowledgeable. All around a very great experience. The guys definitely know what they are doing, I had a huge warehouse completely re-done with a beautiful new epoxy floor and it came out even better then I imagined. Thank you guys. If you are looking for epoxy flooring in Boise, call these guys. There is no one better in Boise to take care of your epoxy flooring and i can say that from experience. Curious about how epoxy flooring will look in your basement or garage? Want a durable flooring solution for your business? Want to update the look of aging concrete? We are always just a call away to answer any questions you have. Here are some frequently asked questions about our concrete services. Q: How will the concrete surface be prepared for epoxy? A: We believe that careful preparation is one of the most important ways to guarantee a long-lasting floor with a superior bond. We take the time to lift stains like gasoline and oil before filing joints and cracks in your concrete floor. This is essential for smooth, flawless results. Any damage in your concrete will also be repaired before epoxy is applied. Once the concrete is clean and in good condition, we will complete diamond grinding to correct surface irregularities and open pores in the concrete to improve the strength of the bond. Q: How long will an epoxy floor last? 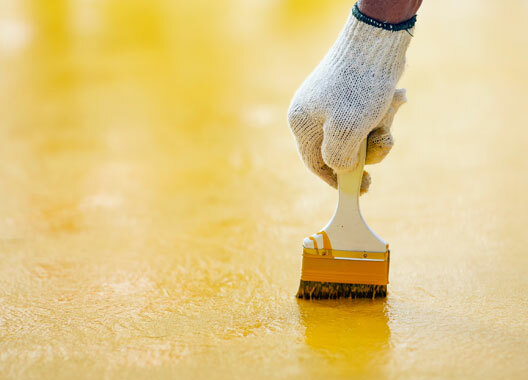 Epoxy can be very long-lasting, especially when it’s installed in an area with light to medium heavy-duty use and no UV exposure, such as an epoxy basement floor or a garage floor coating. In many home and commercial settings, epoxy floor coatings in Boise can last for 10 to 20 years or even longer. 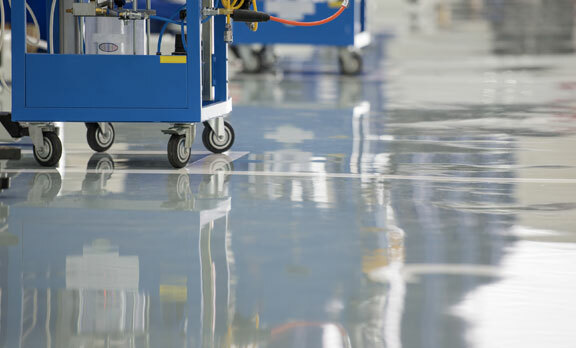 Even in industrial settings like factories, epoxy can last for 7 to 10 years. Quality of the epoxy. DIY epoxy kits may only last 1 to 2 years but professional high-quality epoxy can last decades. Concrete preparation. If the concrete isn’t properly prepared, the epoxy will not bond and peel eventually. Wear and tear. The greater the wear and tear, such as heavy loads, chemical exposure, and vehicle traffic, the sooner the epoxy floor coating will wear out. Installation. Professionally installed epoxy flooring lasts longer than epoxy installed by inexperienced contractors and homeowners. Q: Do you do commercial epoxy flooring along with residential flooring? A: Yes, we offer residential and commercial epoxy flooring installation throughout the Boise, Idaho area, including surrounding areas of Meridian, Nampa, Caldwell, and Eagle. In addition to our popular basement and epoxy garage floor coating, we install high-quality commercial and industrial grade epoxy flooring for businesses like medical centers, shopping centers, and auto shops. Call for a free quote from Boise City’s Best Epoxy Flooring Company.